But, compiled EXE file is built and works good! After few compilations, IDE generated .exe file and still lives!!! The version of IDE that you are using are compile with 2.8.9. 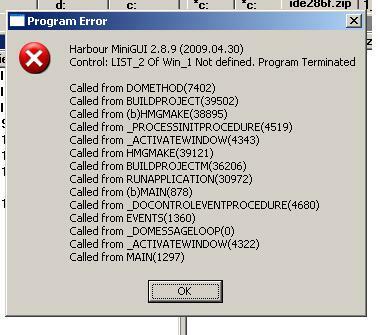 As the fatal error is in IDE, the HMG version shown is 2.8.9. I could be more helpful on this if you give some clue about how to reproduce the problem. Had you edited the form code with an external text editor? When the first time of error occus, I'm sure that I didn't use any external editor to edit form code - I've copied my project from one computer to second via pendrive. Second occurance of error - I've use editor to edit main window to duplicate two lines in Main Menu of form - error occured. Now, I've saved main form from IDE and everythink is OK.
mol wrote: When the first time of error occus, I'm sure that I didn't use any external editor to edit form code - I've copied my project from one computer to second via pendrive. I've not documented clearly the fact that reading 'by hand-edited' forms could produce unexpected results and is not guaranteed to work. I'll remedy in the next release. Error occurs after successful compilation - so everything inf form is OK, I think. Maybe my editor (I use notepad++) puts some extra characters? I've tried edit form by notepad++ and incremental compiling - it's OK. But resetting incremental compiling and full building crashes IDE.